Duck boat tours will no longer be seen in London after the company which runs them lost access to the ramp used to enter the River Thames. The slipway beside MI6's building in Vauxhall is to be acquired by Thames Water for construction of the Thames Tideway Tunnel. 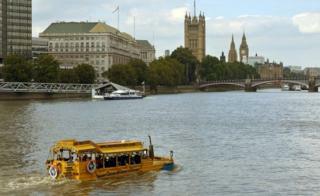 London Duck Tours managing director John Bigos said it was a "very sad day for the company". The last tours will take place on 17 September. More than 1.8 million passengers have travelled on the amphibious vehicles since the service began. "Tourists worldwide and Londoners will surely miss our iconic bright yellow DUKWs travelling around town," Mr Bigos said. But he said it was "vital not to delay construction of this much needed infrastructure project". The 15-mile (25km) "super sewer" will remove tens of millions of tonnes of sewage pollution from the river, according to Thames Water. In a statement, the firm said it had tried to help relocate the tours and find ways for them to continue during construction but "no suitable option or alternative location was found". In 2013, London Duck Tours had its tours suspended after one of its amphibious vessels, Cleopatra, caught fire.